itel S31 in an entry-level smartphone and a successor of the itel S11 which was announced/launched on November 7th, 2016, and made available in market on November 14th, 2017. The smartphone doesn’t have much since most of the specification as the same as it’s predecessor. However, right now the all the itel S-series smartphones are being marketed as Camera phones, where ‘S’ simply means selfie. This would better suit first time smartphone owners who get to have a feel of taste on owning a smartphone. After using the phone thoroughly, he’s our final review. Itel S31 comes in three color variants; Black, Rose Gold, and Champagne Gold. It has rounded edges at the back which make the phone easier to grip. The front is dominated by a 5.5-inch IPS HD screen display and touch keys below it. Above the display is the 3.5mm audio jack, and the usual array of sensors. The 3.5mm audio jack appears on top while the rear camera appears at the top-left corner with the LED flash below it. The lower bezel has no physical keys on the front, but rather has the touch keys. The volume rocker and power key are on the right. At the bottom there’s a microUSB port. The rear panel has the protruding camera setup, with the itel branding just at the bottom, and the speaker grille at the bottom left. The volume rocker and the power button appear at the right. The speaker grille appears at the back, seen at the botton-left while the microUSB port appears on the bottom. The phones start with the lock screen, the battery alert appears on top, while the time & date visible on the bottom-left of the lock screen, with a default camera shortcut at the right bottom where users are able to use the camera without/minus unlocking the screen. Slide as preferred to unlock the screen, you’re opt to unlock with a password or a 4-pin digit number or a pattern – only if you have a screen lock available. 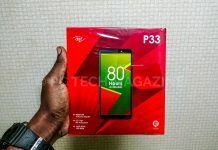 Itel S31 is powered Mediatek MT6580, Quad-Core 1.3 GHz, Cortex A7 processors with 1GB of RAM and 16GB of internal storage (ROM) with an expandable slot of up to 32GB. The hybrid dual-SIM slot means users have to choose between expandable storage and dual-SIM functionality, the first slot being for a Full sim-card, the second slot being for a Micro sim-card, will the expandable microSD card comes in between the two sim slots. Dual-SIM functionality that take up a full and micro sim-cards will the expandable microSD card comes in between the two sim slots and the 2,400mAh Li-ion removable battery with a limited charge voltage of 4.35V appears below. 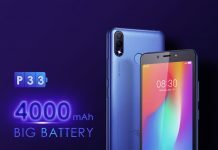 There’s a 2,400mAh Li-ion removable battery with a limited charge voltage of 4.35V as well that can last for at least 24 hours on talk time and 3 hours on standby time. During our short time with the device, we found it to be decent enough. General performance is overall satisfactory and there are no lags or freezes. The phone handles random app switching and multitasking quite efficiently. Itel S31 runs Android 6.0 Marshmallow topped. No mentions if itel mobiles will receive the Android 7.0 updates. The UI is pretty clean and easy to use. There are a few apps that come pre-installed but most of these can be uninstalled. The Itel S31 rear 5MP camera is setup at the top-left with a LED flash just below it. It can also record Full HD videos at 30fps. The front-facing 5MP camera is setup at the top-right and the flash is on the left. During our testing, we found the overall picture quality to be quite good (Not Bad and Not Good) producing quite pretty good colored pictures. Front camera is decent as well, comes with all standard camera modes like HDR, Face beauty modes and Panorama. Photos below were taken using the rear 5MP camera…. The battery charges really quick, but drained faster when on 3G. Not really suitable for gaming, because it would really drain out the 2,4000mAh battery. Given that the smartphone is priced between 310,000 UGX – 330,000 UGX, the itel S31 is likely to compete against budget mid-entry handsets like the Infinix HOT 4, Huawei Y6 II, and so forth. However, on the surface, it’s a really capable smartphone that one can own.